Our cabins bring guests closer to nature; lining the shoreline with picture window postcard views. 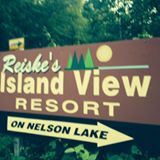 Reiske’s Island View Resort is ideally situated on the shores of beautiful Nelson Lake just outside Hayward, Wisconsin. 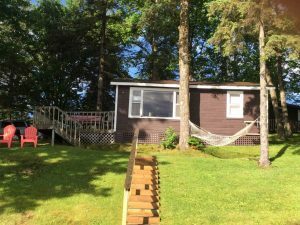 Located just minutes from unique Hayward boutique stores, some of the best fishing lakes in northern Wisconsin, and all the attractions of Hayward, including the Fresh Water Fishing Hall of Fame, Lumberjack World Championships and Hayward Fall Festival. Many of our returning guests have been doing so for years – sometimes through generations – and Reiske’s Island View Resort is proud to have been a part of their memories, and we’re glad to soon be part of yours! A boat is available with each cottage if guests bring their own motors. The resort also offers a paddle-boat and canoe on premises available at no charge. There is a swimming area with raft and a boat launch on premises available to our guests. For visitors looking to experience the quiet beauty of the Hayward Lakes region in relative seclusion and privacy, Reiske’s Island View Resort is the choice for you.